This is my take on connecting with our community this Easter. ‘Christian tradition, pagan festival, money-making exercise… what exactly is Easter? If it is about someone dying on a cross, and rising from the dead, why? If it is supposed to have something to do with me, why? If it is supposed to change the world, why? 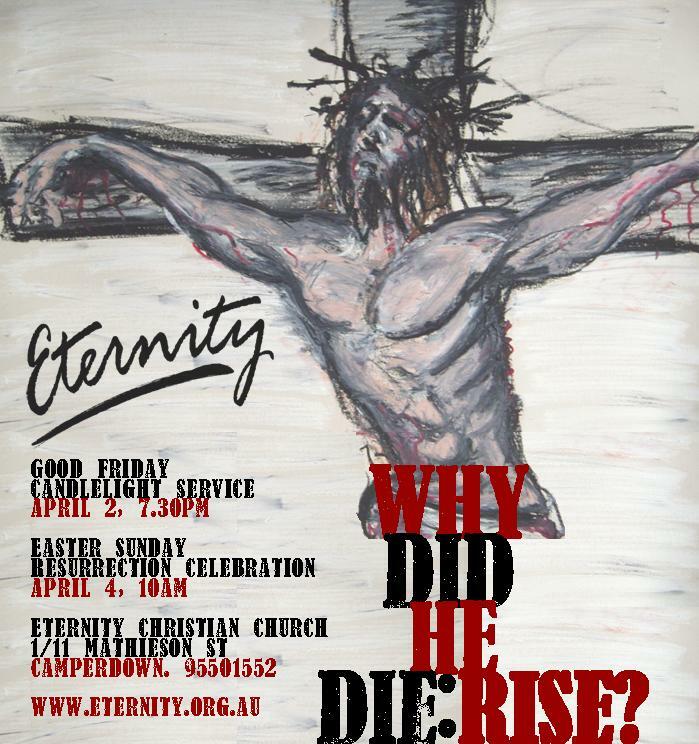 Easter 2010 at Eternity Christian Church is an opportunity for asking and answering questions; for reflecting, belonging and celebrating. The painting is by Canberra artist Ben Sherwood who did this pastel on cardboard piece in about 30 minutes during an Easter service at Newtown Neighbourhood Centre quite a few years ago (if your out there somewhere Ben, drop me a line!) It now hangs in our church and is one of our favourite works of art. We borrowed the Good Friday Candlelight Service idea from a church in Port Macquarie (saw their posters one year) and it works nicely with the quieter, reflective feel of Good Friday. Posted in Art, Church, FindingFaith, Musing.Tagged cross, Easter, faith, Jesus.